House for sale Makati Best Breakfast (Fried Rice) in Guam. Guam Breakfast (Fried Rice). guam travel, Are you looking for the best of Guam’s Breakfast Fried Rice? Well, you’ve come to the right place. 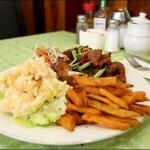 Hotguam.com gives you the top rated breakfast place here on the island. Guam’s well known breakfast place on the island is no other than Shirley’s Restaurant. This place is well known for their fried rice. Shirley’s fried rice consists of mixed vegetables such as peas, corn, carrots, spam, sticky rice, soy sauce, and sesame oil. They might have added some kind of special sauce on it that makes locals and tourists come back and order more. I wonder if they add MSG on it, that would really be a bummer because MSG is so not healthy for you. I think MSG should be banned all together in all restaurants. But restaurant owner can’t help it because it makes their food taste much better and some people don’t really care what’s on their food anyway. One of my favorite Breakfast Fried Rice is mixed with beef, pork, seafood, and chicken. Eat with with some sunny side up eggs or over easy eggs or over medium eggs and you’re set to go. One of Guam Breakfast Fried Rice Restaurant local favorite is Denny’s. Not only do they serve international breakfast, they also make local menu breakfast. Their top menu consists of Tilapia with egg, Tapsilog, Langonisa, Tocino, and my personal favorite Garlic Fried Rice with Spam and eggs. Nothing is better than a hearty breakfast to keep you energized throughout the day.